Dr. Billings has been nominated for the National Medal of Science Award, this country’s highest honor for individuals who have made significant contributions in science. The award will be presented to the recipient in the White House by the President of the United States. Dr. Billings has been nominated for his groundbreaking work in hydrogen energy, as well as his contributions in developing GoldKey security technology, WideBand Computer Networking and for the Acellus Learning System. The following letters were submitted to the National Science Foundation (NSF) recommending Dr. Billings for this prestigious award. Comments regarding Dr. Billings nomination may be submitted below. Dr. Roger Billings has long been recognized as an innovator of advanced technology and is one of the science and technology luminaries of our time. In the field of computer networking, Dr. Billings has blazed the trail from the beginning. At the dawn of the age of the personal computer, when the industry was contemplating how to maximize and harness the new microprocessor, Billings was building personal computers — complete with software that included a user-friendly word processor, spreadsheet, and electronic mail. While the rest of the industry struggled for a way to effectively share data in a computer network — Billings introduced an elegant, straightforward method. Up to that time computer networking had been hindered by a disk-server technology that only worked if all the computers sharing data were running the same operating system. Billings’ method, which he patented as Functionally Structured Distribution (FSD), took an entirely different approach, allowing computers running any operating system to share data over the network. FSD has since become the most widely-used deployment of client/server networking, and it is one of the enabling technologies of the Internet. Turning his attention to the need for higher-performance networks, Dr. Billings recently worked with the US Army to design a next generation rapid communications platform to reduce computer network latency, with equipment that reached network data rates of 100Gigabit/sec. Billings is making a significant contribution to cyber-security with one of his latest innovations, GoldKey, a digital security system that stores the encryption function within the security device rather than sending over the Internet/network, allowing for the secure transfer of confidential information. He foresightedly included an innovative hierarchical security key management system, allowing enterprise administrators to manage the privileges given to each individual token deployed within their organization. As he has repeatedly shown in his computer technology endeavors, Dr. Billings has the ability to see a critical need and to devise a solution that is sophisticated, far-reaching, and powerful. Truly he is one of the brilliant minds of our time and is most deserving of this recognition. Hydrogen energy is a passion Dr. Roger Billings and I have in common, and it is a pleasure for me to recount some of the significant contributions he has made to the science and the implementation of that important energy alternative. Roger was always an inspiration to others in the industry – always a “doer.” Yes, he did his homework — applying the science and conducting the experiments — but then he put his research into implementation. His goal was not only to prove that hydrogen as a fuel was feasible, but to make it economically and commercially viable. That commitment to viability resulted in the first fuel cell car, which he built in 1991. In my foundational role with the International Association of Hydrogen Energy, I have seen Roger’s technical savvy and enthusiasm catalyze the hydrogen energy movement, demonstrating the versatility of using this ubiquitous energy carrier to help satisfy America’s energy demands. As friend and colleague, I would like to strongly recommend Dr. Roger Billings for the National Medal of Science award. Dr. T. Nejat Veziroglu is a professor emeritus at the University of Miami, and during the 1970s chaired its mechanical engineering department and was its associate dean for research. He is the President of the International Association for Hydrogen Energy and founding editor of the International Journal of Hydrogen Energy. This letter being written in recognition of the significant contributions that Dr. Roger Billings has made in two different fields: hydrogen energy and distance learning through development of the highly successful Acellus learning system. With respect to hydrogen energy, Dr. Roger Billings had the extraordinary vision of developing hydrogen as a source of energy and fuel beginning as far back as the 1970s. His scientific and innovative skills enabled him to effectively address one of the most pressing needs of our times. Dr Billings used his technological expertise to demonstrate and set in motion an alternative energy movement — one based on hydrogen. He developed a prototype automobile using hydrogen as its fuel, an alternative now being promoted as breakthrough technology by several entrepreneurs in the automobile industry. More recently, he has developed the fuel cell car which substantially addresses pollution and our historic reliance on foreign oil. Again, he developed technologies that have paved the way for others to follow suit. On a subject on which I am particularly familiar, Dr. Billings has exhibited the same technological genius in the field of education. With the recent challenge of raising the education standard of American youth, Dr. Billings developed a computer-based learning system that educates students on a level that empowers them academically for their future responsibilities as citizens of this country. What sets his Acellus learning system apart is that the system has a unique capability of customizing course content to satisfy the needs of each individual student. Its scientific approach to learning allows course developers to continually enhance instructional materials to improve the effectiveness of the program, tailored to the needs of each student. In my experience, his program stands out among the many distance learning programs due to its continual improvement such that the learning system has been accepted at elementary and secondary school systems throughout the country. Dr. Billings is a man ahead of his time and yet very much in tune with the significant challenges we face today using his creative brilliance to bring about effective solutions. I have witnessed his successes in the field of hydrogen energy as well as superior distance learning instructional programming firsthand. I am honored to recommend Dr. Roger Billings as a recipient of the National Medal of Science. 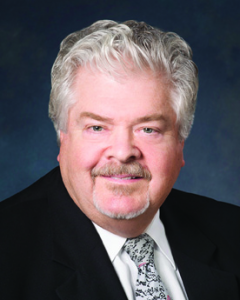 John R. Phillips was appointed to the University of Missouri Board of Curators in 2013. Phillips is with the Husch Blackwell LLP law firm, specializing in labor and employment relations and healthcare law. Among other civic responsibilities, he currently serves on the Board of Directors for Saint Luke’s Health System and is a member of the Society of Fellows for the Nelson-Atkins Museum of Art. This letter is in recognition of Dr. Roger Billings’ lifetime dedicated service to the youth of America and his genuine commitment to make effective education available to all. His passion for Mathematics and Science serves as a beacon of light guiding our youth to solve some of America’s greatest challenges and carry our country’s legacy of innovation into future generations. Dr. Billings’ commitment to education is one of the hallmarks of his life and of his career. He has long recognized the importance of education in empowering our young people in carrying into the future this country’s legacy of innovation and ingenuity. His background in science and computer technology has built a robust learning platform through Acellus learning environment. Building on what students know, Acellus makes it possible to customize the learning environment to address each student’s individual needs to meet and exceed the core content learning standards. One of Dr. Billings’ most significant contributions to education is Acellus. Acellus is a computer-based learning system that uses technology to customize courses addressing the learning process, provides data that allows course developers to see what works and what does not work, and allows the educators to make changes in the delivery of instructions where needed for increased learning effectiveness. As an administrator in public, charter, and private schools across Los Angeles; I brought Acellus into my schools. In my classrooms, Acellus provided learner’s help who needed tutoring for remediation, credit recovery for failed classes, advanced study for unavailable courses at the school site, grade level core instruction, and specifically designed individual classes for students with special needs. My students, teachers, and parents saw almost immediate results. We observed improved academic achievement, improved attitude to learning, motivation through ongoing success, and student’s discovered new hope in their ability to learn and sustain their academic success. I am currently using Acellus as the mainstay learning platform in the Intensive Support and Innovation Centers that I operate in the state of California. I am impressed with the systemic approach to learning that Acellus is making my work more effective and its positive impact on the youth I work with every day. The students are career ready and college prepared. I believe Dr. Billings has had a far-reaching influence on education, and that his hard-work and dedication to using science and technology to make constant improvements makes him most deserving of the National Medal of Science. Dr. Baker’s teaching and administrative career has spanned across the k-12 grade levels in both Illinois and California. His knowledge, experience and expertise ranges from classroom teacher to administrator of private schools. He is currently Director of Education at Destinations to Recovery.